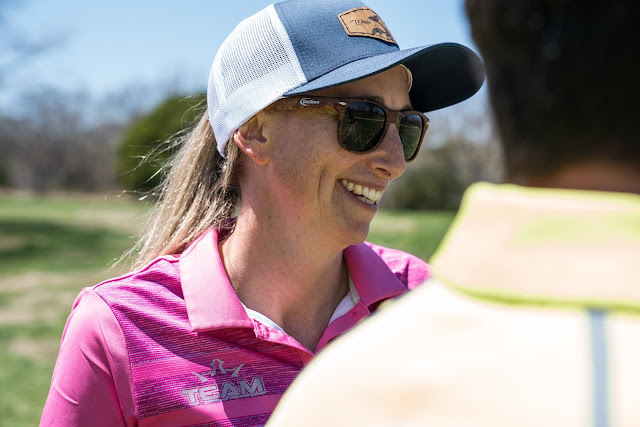 When you think of women who are making a difference in the sport of disc golf, several prominent names come to mind, including Zoe Andyke. In Part 1 of our DD Women’s Series, we discovered how Zoe got started teaching disc golf and how she’s been able to educate and empower women in the sport. The truth of the matter is, Andyke is so involved in numerous groups and organizations across the US that we couldn’t fit it all into one blog post! Part 2 is here to further explore where Zoe has made an impact on the growth of women’s disc golf and what may be in store for the future! Even before Zoe was laser-focused on teaching women about the sport of disc golf, she found that her own growth as a player naturally drew attention from others. “It started happening early in my professional career where amateur women wanted help with attitude, with sportsmanlike conduct, and just [asking to be] educated about the real rules of the game,” she said. Zoe found that this attraction to helping other ladies in the sport naturally unfolded into some of the activities she’s been hosting for many years. One such instance is the putting leagues that she runs in Oregon. While they aren’t dedicated to women only, she consistently sees between 5 and 15 women each week. 2018 marks her fifth season of running multiple leagues in both Albany and Eugene, OR along with the help of her touring partner and fellow DD team member Dustin Keegan. The ability to be a touring player not only serves Zoe well regarding her own personal game, but it allows her the chance to teach other women outside of Oregon. This year marks her sixth annual visit to the Daisy Chains Women’s Global Event held in Watsonville, CA. Taking place the weekend before the Masters Cup, it fits in nicely with her schedule and allows her the chance to host a women’s clinic. “Each year I change up who my co-clinicians are for the clinic, and this year Dustin and I are on Team Disc Golf Strong. I’m one-upping my game, and Seth [Munsey] is going to come and will do a demonstration of our standard performance,” Andyke said excitedly. The Daisy Chains group of ladies are known for being incredibly active in the sport and it’s a natural fit for Zoe to be involved. She’s also planning on executing her 4th annual clinic just before the Beaver State Fling in June. Working with the Women of DGOD in Portland, she’s had over 70 women attend in past years. “One of the best ways I can locally service players is through my national outreach and friendships in the pro division. I learned so quickly and got so good due to watching others that were better than me, so for me to bring the highest level of female disc golf to the ladies of Oregon is one of my biggest gifts,” Zoe said. It sounds like Andyke has some exciting events on the horizon outside of her standard touring schedule, so be sure to attend one of her clinics if you’re in the area. Check back with us for Part 3 of this series, where we explore some of the mind-body elements that have helped Zoe to find success.